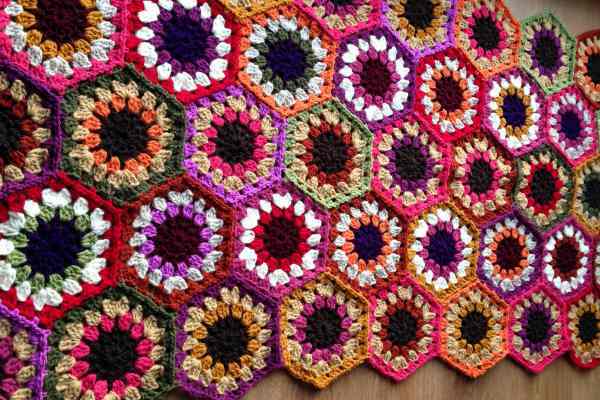 When making a hexagon blanket you can choose to make all the centres first (rounds one and two), then complete all of the third rounds and then finish all the fourth rounds before you start joining. Or you can do what I did, which was to make eight hexagons to the fifth round, joining them up into one row at a time. I found that an easier way to keep myself motivated, but its all down to personal preference. For each hexagon, you need to complete round five, the joining round, as far as you can. It is easier to work on the hexagon away from the blanket. You’ll see that I call each point of the hexagon an apex. If you like you can think of it as a corner. You now need to line up the hexagon motif to be joined with the hexagons already within the blanket. Its easier to do this if you sit on a sofa with the blanket spread on your knee, or spread the blanket out on a table in front of you. In the photo below, the hexagon bordered with copper at the top and the one just showing on the left, bordered with magenta, are already in the blanket. The hexagon with the partly completed fifth round in meadow is ready to be joined in. You should have already worked round five on the hexagon to be joined and you should have completed two trebles in the third apex. After completing the second treble stitch do not make a chain as you would normally. Put your hook through the apex space of the hexagon in the blanket that you are joining to first. The hook goes in from bottom to top as shown. Make sure your yarn is not over to the right and behind the hook, as in this first picture. I was just showing the positioning of the hook. Look at the second picture.You need to bring the yarn over so its in the right place to complete your dc stitch. As you complete the first dc joining stitch you will need to bring the hexagons together, wrong side to wrong side and match up the spaces in both hexagons. You now need to make two more trebles in the hexagon you are joining to complete the apex. Do not make these stitches into the hexagon you are joining to, just into the hexagon that is being joined. You then make the next joining dc into the next space in both hexagons before completing three treble stitches in the next space of the hexagon you are joining in. Carry on in the same way along the side of the hexagon. You have now reached the next apex. You need to join this apex to the those of both the copper hexagon and the raspberry hexagon. Do one joining dc into the apex space of the first hexagon, then a separate dc into the apex space of the second hexagon. Then make the second two trebles to complete the apex of the hexagon you are joining. Then make two trebles to finish off the apex. These stitches just go into the hexagon that is being joined, not into either of the hexagons that already form part of the blanket. You then continue to join along the side of the second hexagon already in the blanket in exactly the same way. Hold the hexagons together wrong side to wrong side and match up the spaces. Then continue making clusters of three trebles with a joining dc in between. Complete the third apex in the same way, making a joining dc in between the two pairs of trebles. Then you don’t make any more joining dc stitches. You simply complete the hexagon you are joining along its last unfinished side for its fifth round. Finally, fasten off and weave in your ends.